Care2 Healthy Living | What Does Cacao Percentage Mean on a Chocolate Bar? It’s important, but higher isn’t always better. When shopping for good chocolate, one thing you should look for is the cacao percentage. This tells you far more about the quality and taste of a product than simple descriptions such as milk, semisweet, or bittersweet. Here’s a quick guide to deciphering cacao percentages before you head out to do any Valentine’s Day shopping. What is a cacao percentage? 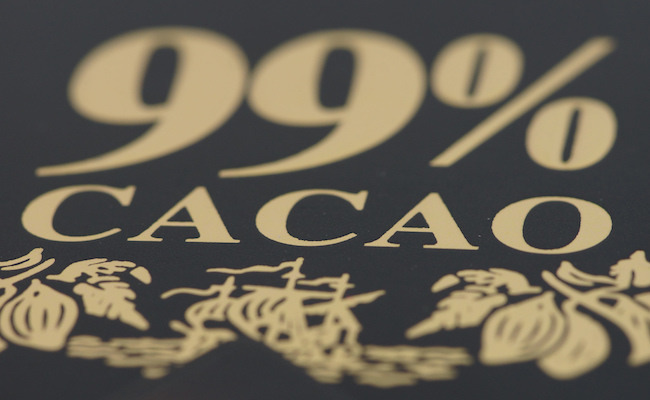 You can take the cacao percentage on the label and know that the remainder comprises whatever fillers the manufacturer has added. This could be sugar, dairy, soy lecithin, vegetable oil, vanilla, etc. Cacao is known to contain nutritious flavonoids, which are antioxidants that “provide heart-protecting, anti-inflammatory, brain-boosting, mood-lifting properties.” A once-a-week chocolate habit has even been linked to improved cognitive performance! It’s only natural that the more cacao a bar contains, the more of those flavonoids it will have, not least of all because there’s less room for additives. The production process matters as well; fewer ingredients, careful roasting, and skilled blending of the beans will result in a more nutritious product. You are more likely to find that when buying chocolate from smaller-scale producers, not giant candy corporations. In other words, taste it and see for yourself what you think. I've had fun exploring a lot of high cacao chocolate bars, and have settled on an affordable organic 84% truffle bar for my standard treat. I still enjoy trying others occasionally for a change of pace, but anything less than 72% cacao is just icky sweet.